A plugin to retrieve lyrics from Netease Cloud Music(Wangyi Yun Yinyue, a cloud music service from china). It can also combine the lyrics with its translation if available. This is another lyrics retrieval plugin. It can get synchronized lyrics from Netease Cloud Music(a cloud music service in China). But if you don't want this function you can disable it in plugin settings. Hit the download button above! Install(via "Add plugin" button) and enable it in the Plugin tab in the preferences. 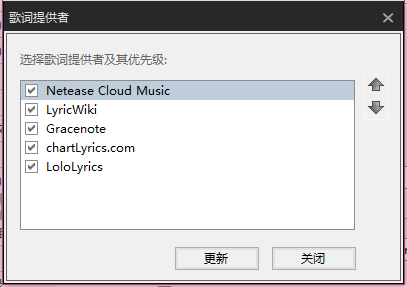 And adjust the retrieving provider priority of "Netease Cloud Music" in the Tags(2) Tab. And this plugin is also useful for people who aren't from China as Netease CloudMusic also has bunch of songs in other languages. You can disable the translation in the plugin settings.